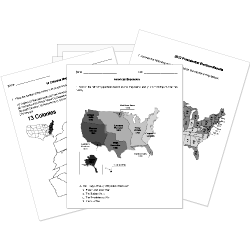 You can create printable tests and worksheets from these American Imperialism questions! Select one or more questions using the checkboxes above each question. Then click the add selected questions to a test button before moving to another page. Reinforcements from Goliad arrived at the Alamo. Which event contributed to the outbreak of the Spanish-American War? Which President believed in the Open Door Policy in China? The attempt by a nation to build an empire either through direct conquest or economic and political control of other countries or territories. Social Darwinism is the "Survival of the Fittest." In 1895, which country rose in rebellion against Spain? Why was the battleship "Maine" sent to Havana, Cuba in 1898? To get rid of the Spanish government there. To spend some time on the beaches. To protect the Americans who were living there. Which statement best describes President Theodore Roosevelt's foreign policy position toward Latin America in the early 1900s? The United States should reduce its involvement in Latin American affairs. The Monroe Doctrine permits the United States to intervene actively in the affairs of Latin American nations. In what year did America officially declare war against Spain? Which United States foreign policy was most directly related to the rise of big business in the late 1800s? What was NOT an effect of the Spanish-American War? Hawaii became the 50th state. United States controlled formerly Spanish territories including Guam, the Philippines and Puerto Rico. â¢	The outbreak of the Spanish American war led to the annexation of territories by the United States. One of President Theodore Roosevelt's goals was the build the Panama Canal. What was the Panama Canal? A man-made river through Mexico. A bridge through Central America. A canal across the narrowest part of the country of Panama. A series of boardwalks across the Isthmus of Panama. Who fought in the Spanish-American War? The United States fought against Spain to help other countries gain their independence. Mexico fought against the United States. The United States fought against Guam. made Puerto Rico a territory of the U.S.
allowed Puerto Ricans to elect members of both houses of their legislature. What do Cuba, Puerto Rico, Philippines and Guam have in common? What did NOT motivate the United Statesâ declaration of war against Spain, the American involvement in the Panamanian revolt, and in the American involvement in World War I? After the end of the Spanish-American War, the U.S. immediately withdrew its troops from Cuba.